Salmonella phages SenALZ1 and SenASZ3, two novel phages infecting Salmonella enterica, were isolated and analyzed. The genomes of these two phages consist of 154,811 and 157,630 base pairs (bp), with G+C contents of 44.56% and 44.74%, respectively. Fifty-nine of 199 open reading frames (ORFs) in the SenALZ1 genome, and 60 of the 204 in the SenASZ3 genome show similarity to reference sequences in the NCBI nr database that encode putative phage proteins with predicted functions. 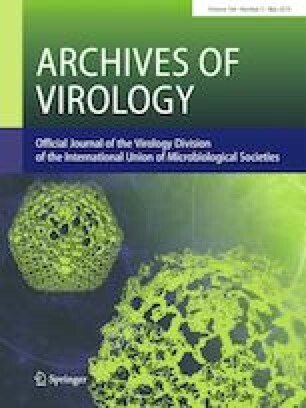 Based on the results of transmission electron microscopy (TEM) examination, complete genome sequence alignment, phylogenetic analysis, and gene annotation, we propose that these two phages are representative isolates of two new species of the genus Cba120virus, subfamily Cvivirinae, family Ackermannviridae. Ling Chen and Guoye Guan contributed equally to this study. Nucleotide sequence accession numbers: The complete genome sequences of SenALZ1 and SenASZ3 have been deposited in the GenBank database with the accession numbers MH709121 and MH709120, respectively. The online version of this article ( https://doi.org/10.1007/s00705-019-04183-3) contains supplementary material, which is available to authorized users. We are grateful to J. Feng from the Institute of Microbiology of the Chinese Academy of Sciences for providing bacterial strains. This study was funded by the Shenzhen Science and Technology Innovation Committee (JCYJ20160229201759414, JCYJ20170818155011625) and the Shenzhen Peacock Team Project (KQTD2016112915000294 and KQTD2015033117210153). This work was also funded by the National Natural Science Foundation of China (31570115, 31570095, 31500104) and the Engineering Laboratory for Automated Manufacturing of Therapeutic Synthetic Microbes (Shenzhen Development and Reform Commission no. 1194).